The complex and ever-changing rules governing American presidential nomination contests are continuously up for criticism, but there is little to no consensus on exactly what the problems are, or on how to fix them. The evolving system is hardly rational because it was never carefully planned. So how are we to make sense of the myriad complexities in the primary process, how it affects the general election, and calls for change? 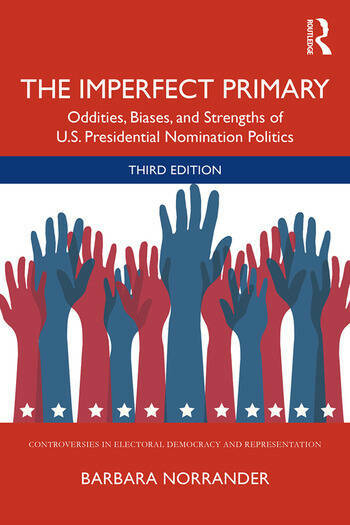 In this thoroughly updated third edition of The Imperfect Primary, political scientist Barbara Norrander explores how presidential candidates are nominated, how that process bridges to the general election campaign, discusses past and current proposals for reform, and examines the possibility for more practical, incremental changes to the electoral rules. Norrander reminds us to be careful what we wish for—reforming the presidential nomination process is as complex as the current system. Through the modeling of empirical research to demonstrate how questions of biases can be systematically addressed, students can better see the advantages, disadvantages, and potential for unintended consequences in a whole host of reform proposals. Fully updated through the 2016 elections with an eye toward 2020. Tracks the changing role of key primary features including superdelegates, PACs, debates, rule changes, open and closed primaries, caucuses, and the electoral calendar. Includes new discussions of the impact of multicandidate contests and "The Good, Bad, and Ugly of Social Media." Continues the discussion of Electoral College challenges and reforms. 3. Is This a Fair Way to Select a Presidential Nominee? Barbara Norrander is a professor in the School of Government and Public Policy at the University of Arizona. She has been writing about presidential nominations since the 1980s.